Growing up in Texas, I like to think that the Lone Star State is about as cowboy as it gets. To see a bonafide cowboy shopping at the local grocery store was not a strange occurrence. 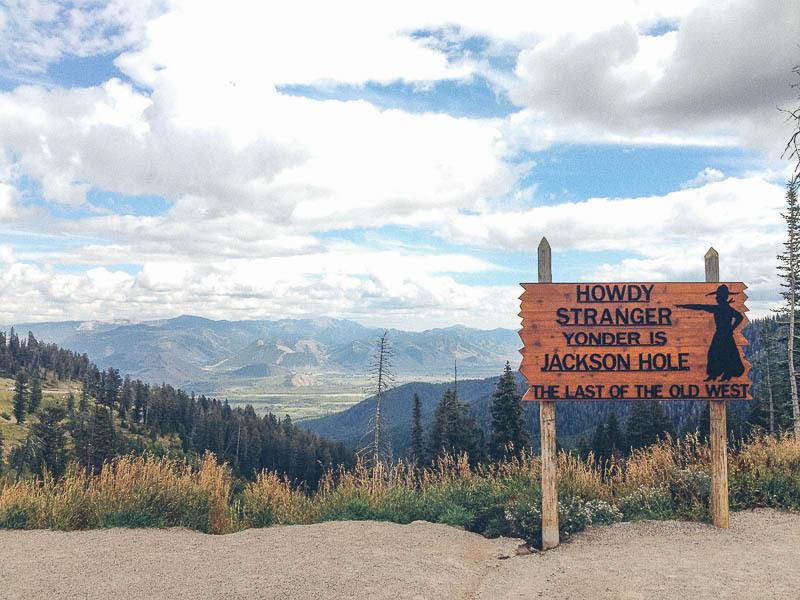 So when we arrived in Jackson, Wyoming, I was blown away: this was the real Wild West. Instead of driving through Yellowstone and getting stuck behind wildlife rubberneckers, we took the backroads through eastern Idaho. It was mostly rolling farmland until we reached the Tetons: we held our breath as we passed a sign that warned "12% Grade Ahead". B.B. huffed and puffed her way to the top of the pass and we were rewarded with an incredible view of Jackson Hole and the surrounding Teton Valley. 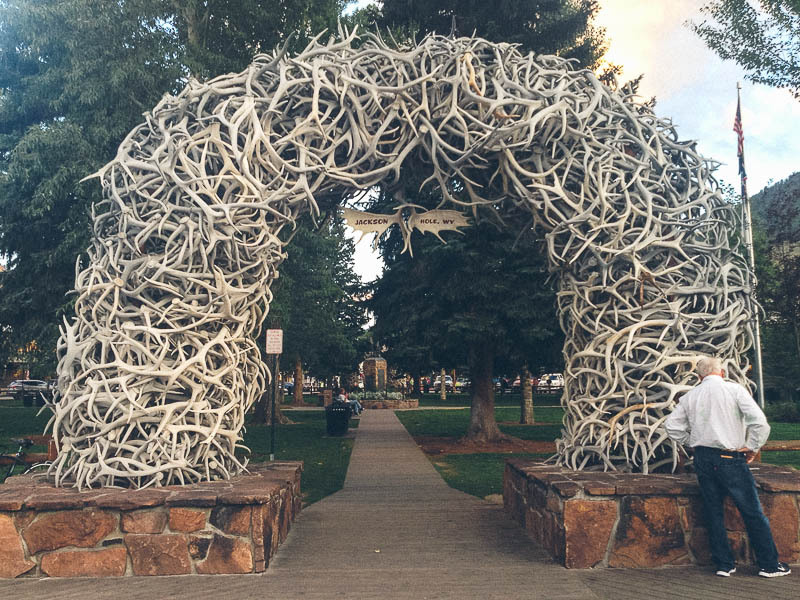 While we didn't do much exploring in Grand Teton National Park - few dog-friendly hiking and not enough days - we did check out downtown Jackson. 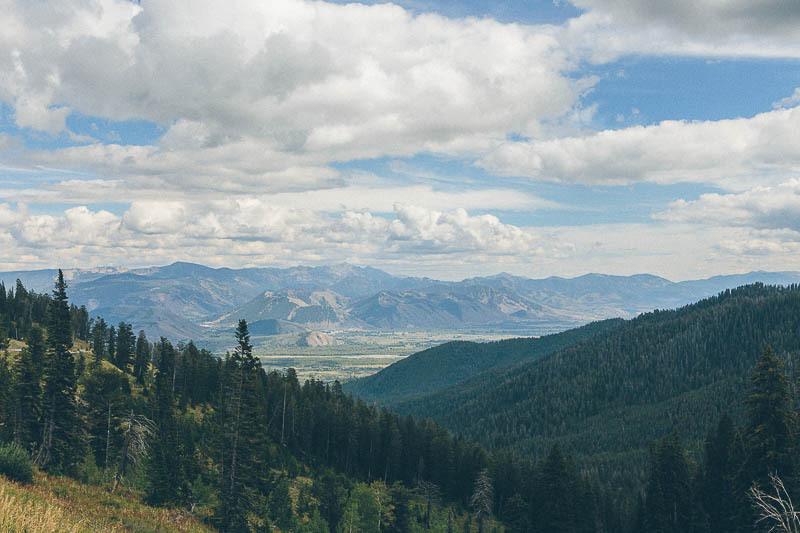 Jackson, commonly referred to as Jackson Hole, is known for their world-class skiing and like every ski resort town, attracts a wealthy crowd. 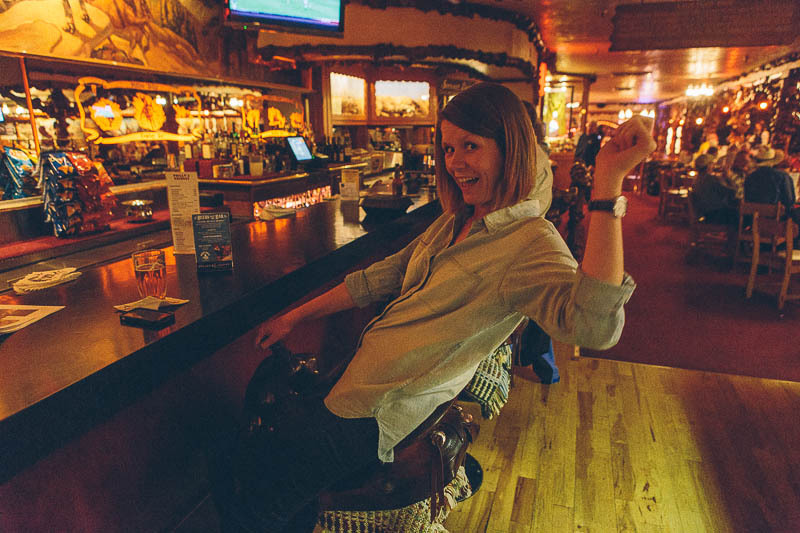 But we were interested in checking out one place in particular: The Million Dollar Cowboy Bar. 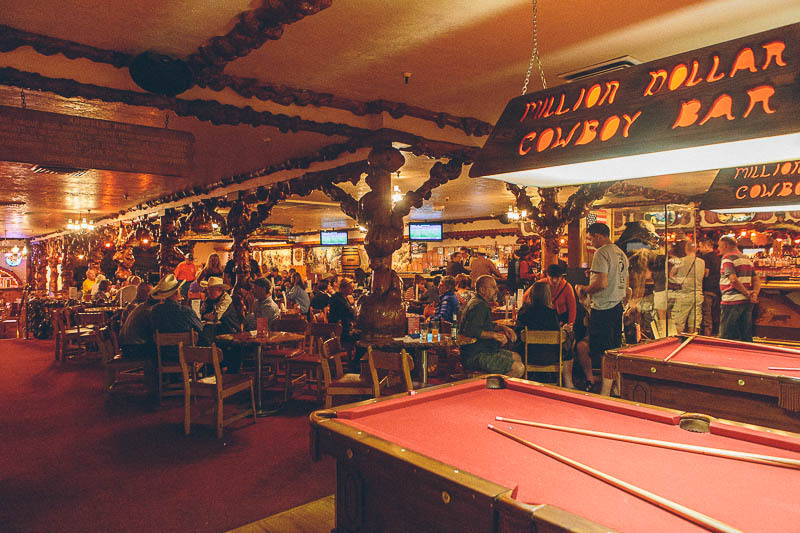 The Million Dollar Cowboy Bar is just about as awesome as it sounds. Its Vegas-esque neon sign shines across the street from the main town square, which features four gigantic arches at each corner made completely of deer antlers. 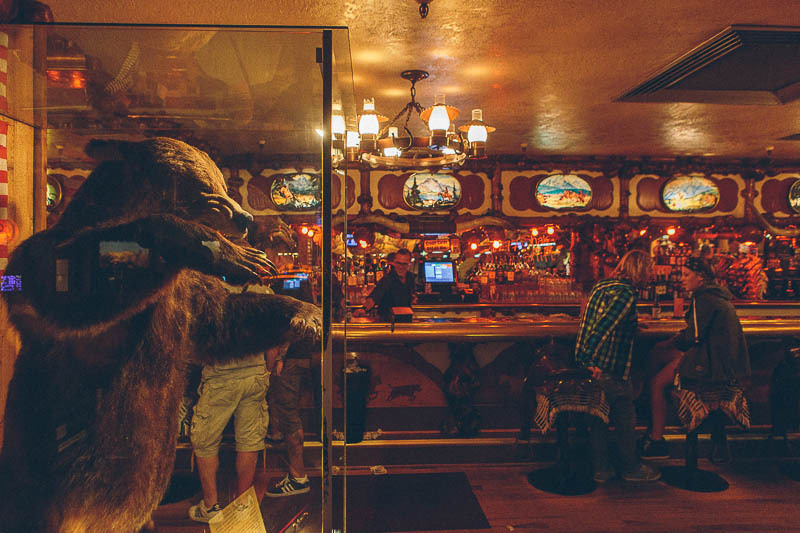 Walking into this bar is like walking into a David Lynch film set in the Wild West. The lights are red and dim, there's kitschy cowboy memorabilia and mounted longhorns all over the walls and the bar stools are saddles. That's right, you ride the bar stools. There are velvety pool tables, an entire gift shop and a shoe shiner who was polishing a real cowboy's boots. It was hard to tell if this place was serious or joking. 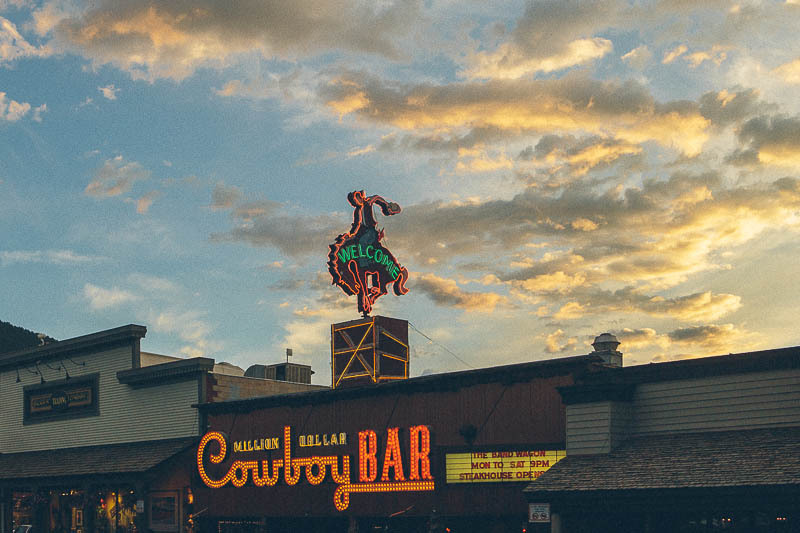 Was it the Disneyland stereotypical cowboy bar that they thought tourists expected or is this place the real deal? Considering it's been around since the 1890s, I would guess the latter. As we left Jackson after too short of a stay, we drove alongside the dramatic Teton Mountain Range towards the rest of wild Wyoming. We stopped at the Moulton Barn, also known as the most photographed barn in America. Not too far north of Jackson, the still-standing Moulton Barn was part of a homestead built in the early 20th century by early Mormon settlers. 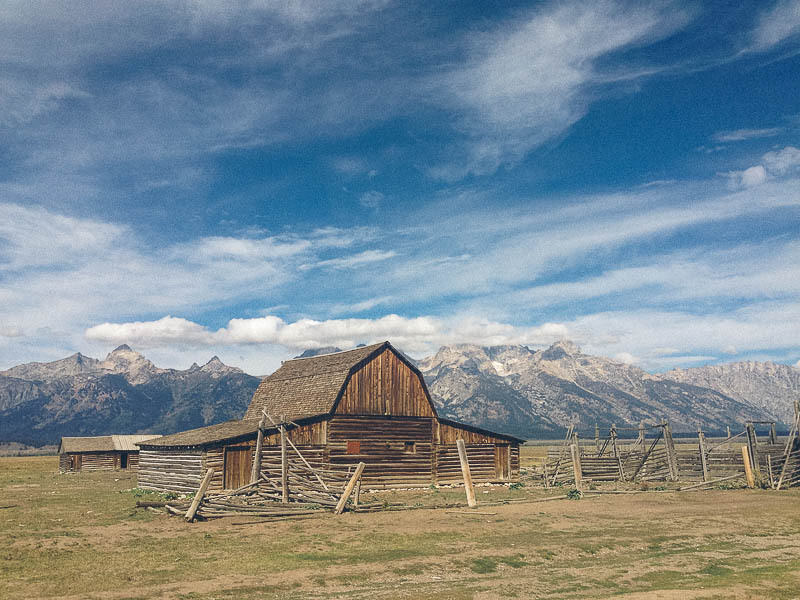 While I snapped photos of the picturesque barn with the Tetons as a backdrop, John was taking advantage of how small B.B. and Loretta looked in front of the looming mountains. Even after spending a short time in Jackson, it was obvious that Wyoming maintains the last remnants of the Wild West. This is not because we went to a 125 year-old establishment called the Million Dollar Cowboy Bar. In Wyoming, the towns are small and sparse, the land is raw and wild and the folks that have been living there since the first settlers are proud of both. Special thanks to Alex B. (who suggested grab a drink) for making this blog post possible!